There are tens of thousands of different industrial chemicals manufactured, stored and transported throughout the U.S. and the rest of the world. Each substance has different toxicological properties and physical characteristics. Some industrial chemicals can pose significant health hazards (carcinogens, non-cancer causative agents, reproductive hazards, corrosives or agents that affect the lungs or blood, etc). Some pose no intrinsic health hazards but nonetheless pose physical hazards (flammable, combustible, explosive or reactive). Only an objective toxicological exposure assessment can accurately quantify potential health impacts with respect to industrial chemicals. The following partial list represents common industrial chemicals and contaminants with which TCAS has gained extensive experience over a period of more than 28 years. TCAS has regularly performed toxicological assessments, produced written reports and/or provided expert testimony with respect to exposure, adverse health effects and/or demonstrating or refuting causation subsequent to being retained by defendants, plaintiffs, prosecutors, state attorney generals, public defenders' offices and U.S. Attorneys' offices. Please contact our office for information concerning any industrial chemical not included herein. Show all results for "Acids"
Acids are perhaps the most common of all industrial chemicals and are also essential components for normal body functions in humans and animals. Acids can generally be grouped into two classes: "strong" and "weak." Due to the extraordinarily broad scope of acidic compounds, there are few general rules with respect to the impacts of ingesting, inhaling or coming into contact with acids. Whereas strong acids and some concentrated weak acids are corrosive, there are exceptions (such as carboranes and boric acid). Additionally, some substances containing acid have intrinsically hazardous properties that may be quite different than those of the acid component alone. For example, in a TCAS case study involving phosphoric acid, Dr. Sawyer demonstrated that the plaintiff's exposure to a cleaning product did not contribute to her injury and thus refuted causation in this particular matter. Thus, in any exposure scenario involving acids, each substance must be assessed according to its concentration, chemical form and specific properties. 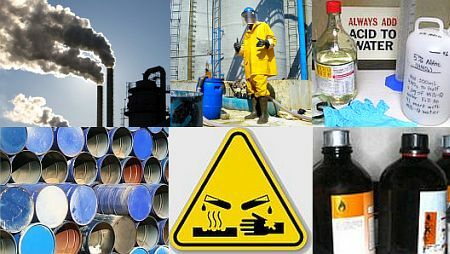 NIOSH (the National Institute for Occupational Safety and Health) publishes detailed information on permissible exposure limits, chemical characteristics, physical properties and health hazards for acids.3 NIOSH also provides recommendations for medical surveillance, respiratory protection, personal protection and sanitation practices for specific acids governed by Federal occupational safety and health regulations. Additionally, the MSDS (Material Safety Data Sheet) published by manufacturers provides information regarding acute and chronic health effects, including hazard identification, methods for treating exposure, physical and chemical properties, stability, reactivity and toxicological data (if available). TCAS has performed toxicological assessments in cases involving acids in both individual and industrial matters. Please contact our office for additional information. Show all results for "Corrosives"
Corrosives attack and chemically damage exposed body tissues. Although many corrosive substances are acidic (see "Acids" above), some corrosives are classified as bases or caustic alkalis. These include such substances as ammonium hydroxide, potassium hydroxide (caustic potash), sodium hydroxide (caustic soda) and others. Many common non-acidic cleaning products have corrosive properties and a wide range of substances in common use exhibit corrosive characteristics. For example, glutaraldehyde (used as a disinfectant and sterilizing agent in medical and dental settings) is harmful if inhaled or swallowed, can be irritating to the respiratory tract, eyes and skin, may cause permanent eye injury and can cause severe allergic skin reactions.4 Similarly, lye (sodium hydroxide, also known as caustic soda) is an inorganic, highly caustic metallic base and alkali salt of sodium. It can cause severe burns in all tissues that come in contact with it. Low-level inhalation as dusts, mists or aerosols can cause irritation of the nose, throat, and respiratory system. Higher levels may cause permanent damage. Corrosives can be toxic by all routes of exposure (dermal, inhalation and ingestion). Tissue damage may occur rapidly or very slowly depending on concentration and chemistry. Depending on the precise chemistry and concentration, acute symptoms can range from mild irritation to immediate destruction of body tissues. Chronic exposure to corrosive substances can cause a wide range of adverse health effects, including scarring, respiratory ulceration and nervous system damage. In some cases corrosives (such as sodium hydroxide) have been reported to be indirect causative agents of more serious diseases (such as cancer) resulting from tissue destruction and scar formation.5 TCAS has in-depth experience in interpreting laboratory test results and assessing toxicological issues for a wide range of corrosives. Please contact our office for additional information. Show all results for "Solvents"
Organic and chemical solvents are primarily used as cleaning agents but have many other uses as well. Common solvents include tetrachloroethylene in dry cleaning, toluene and turpentine in paint thinners, acetone, methyl acetate and ethyl acetate in nail polish removers, hexane and petrol ether as cleaning agents, citrus terpenes in detergents, ethanol in perfumes, etc. These are just a few of the thousands of different types of solvents used in both industrial applications and consumer products. Health hazards associated with solvent exposure include cancer, nervous system toxicity, reproductive damage, liver and kidney damage, respiratory impairment and dermatitis.6 Organic solvents can be especially problematic as many have been classified as carcinogens and/or causative factors in non-cancer health effects. Organic solvents recognized as carcinogens include benzene, carbon tetrachloride and trichloroethylene (TCE). Toluene, tetrachloroethylene, and n-hexane are classified as neurotoxins; 2-ethoxyethanol, 2-methoxyethanol and methyl chloride are associated with reproductive disorders. Additionally, different classes of chemicals can be used as organic solvents, including aliphatic hydrocarbons, aromatic hydrocarbons, amines, esters, ethers, ketones, and nitrated or chlorinated hydrocarbons.7 All of these solvents have specific toxicological impacts and their documented adverse health effects must be precisely quantified when conducting a toxicological exposure assessment based on dose, exposure intervals, routes of exposure and other investigative factors. Producing an objective toxicological assessment of widespread solvent contamination can involve assessing health risks to an entire community. In the case of groundwater contamination, hydrological data may be required to accurately assess the behavior, migration, transport and fate of underground contamination. By collecting the necessary laboratory data, compiling the available human studies, performing the required dose calculations and strictly applying the prevailing peer-reviewed and regulatory assessment methodologies, the expert toxicologist can provide scientifically-credible opinions with respect to adverse health risks, site remediation, the potential need for medical monitoring and other pertinent toxicological issues. Please contact our office for additional information. Show all results for "Trichloroethlyene"
Our Toxic Exposures page illustrates the various pathways used to calculate cumulative TCE dosage in a toxicological exposure assessment. Additionally, TCAS was recently retained to conduct a formal toxicological analysis in a well-publicized case involving a lawsuit filed against a manufacturing company for allegedly contaminating the local water supply with TCE. This trichloroethylene case study illustrates how exposure evidence, historical factors, a well-constructed residential questionnaire and a toxicological risk assessment can significantly impact an outcome in toxic tort litigation. Please contact our office for additional information. Show all results for "Vinyl Chloride"
Although the majority of vinyl chloride exposures tend to be occupational in nature, there have been numerous cases of vinyl chloride contamination in groundwater. TCAS recently conducted a health risk assessment of a plume of groundwater contaminated with vinyl chloride and TCE. Other cases of vinyl chloride contamination continue to be uncovered in the U.S., such as the 2015 Marion County vinyl chloride groundwater plume in Indianapolis, Indiana.13 Such contamination can impact large numbers of residents who depend on groundwater as their primary drinking water source. TCAS has been retained in numerous cases involving vinyl chloride contamination including large-scale releases from chemical facilities, refineries and other sources. Please contact our office for additional information. U.S. Occupational Safety & Health Administration, "Toxic Industrial Chemicals (TICs) Guide," September, 2014. U.S. Occupational Safety & Health Administration, "Best Practices for Hospital-Based First Receivers of Victims," January, 2005. National Institute for Occupational Safety and Health, Occupational Health Guidelines for Chemical Hazards," Publication Number 81-123, June, 2014. National Institute for Occupational Safety and Health, Glutaraldehyde - Occupational Hazards in Hospitals," Publication Number 2001-115, June, 2014. U.S. Occupational Safety & Health Administration, "Solvents," 2016. Centers for Disease Control and Prevention, "Organic Solvents," December, 2013. U.S. Environmental Protection Agency, "Lockwood Solvent Ground Water Plume," April, 2016. U.S. Environmental Protection Agency, "Trichloroethylene (CASRN 79-01-6), Evidence for Human Carcinogenicity," IRIS, September, 2007. U.S. Environmental Protection Agency, "Health Assessment Document for Trichloroethylene Synthesis and Characterization," August, 2010. ATSDR, Division of Toxicology and Environmental Medicine, "Toxicological Profile for Vinyl Chloride," July, 2006. U.S. Environmental Protection Agency, "Vinyl Chloride," February, 2016. U.S. Environmental Protection Agency, "West Vermont Drinking Water Contamination, Indianapolis, IN," April, 2016. National Institute of Environmental Health Sciences, "Trichloroethlyene"
"Toxicological findings involving industrial chemicals must be based on compelling weight-of-evidence. Careful application of generally-accepted methods and multiple peer-reviewed studies are both essential to demonstrate or refute causation."